This outstanding example of a 2019 Mercedes-Benz GLS 450 4MATIC is offered by Mercedes-Benz of Scottsdale. This Mercedes-Benz includes: DRIVER ASSISTANCE PACKAGE Lane Departure Warning Lane Keeping Assist Brake Assist Adaptive Cruise Control Blind Spot Monitor 3-ZONE AUTOMATIC CLIMATE CONTROL Multi-Zone A/C A/C Climate Control Rear A/C PREMIUM 1 PACKAGE Keyless Start Smart Device Integration HD Radio Navigation System Seat Memory Satellite Radio Power Door Locks Keyless Entry Hard Disk Drive Media Storage MP3 Player APPEARANCE PACKAGE Tires - Front Performance Aluminum Wheels Tires - Rear Performance Running Boards/Side Steps TRAILER HITCH Tow Hitch HARMAN/KARDON LOGIC7 SURROUND SOUND SYSTEM Premium Sound System LIGHTING PACKAGE Headlights-Auto-Leveling PANORAMA ROOF Generic Sun/Moonroof Dual Moonroof MANUAL 2ND ROW SUNSHADES ACCESSORY CHROME PACKAGE VENTILATED FRONT SEATS Cooled Front Seat(s) Heated Front Seat(s) *Note - For third party subscriptions or services, please contact the dealer for more information. * This SUV gives you versatility, style and comfort all in one vehicle. You deserve a vehicle designed for higher expectations. This Mercedes-Benz GLS delivers with a luxurious, well-appointed interior and world-class engineering. Navigate through all the icky weather with ease in this AWD-equipped Mercedes-Benz GLS, and even get non-stop traction for your non-stop lifestyle! In addition to the amazing traction control, you may even qualify for an insurance reduction with this AWD vehicle. This Mercedes-Benz GLS is equipped with navigation, so you no longer have to wonder if you're headed in the right direction. Contact Mercedes-Benz of Scottsdale today for information on dozens of vehicles like this 2019 Mercedes-Benz GLS GLS 450. Want more room? Want more style? This Mercedes-Benz GLS is the vehicle for you. Today's luxury vehicle is not just about opulence. It's about a perfect balance of performance, comfort and attention to detail. 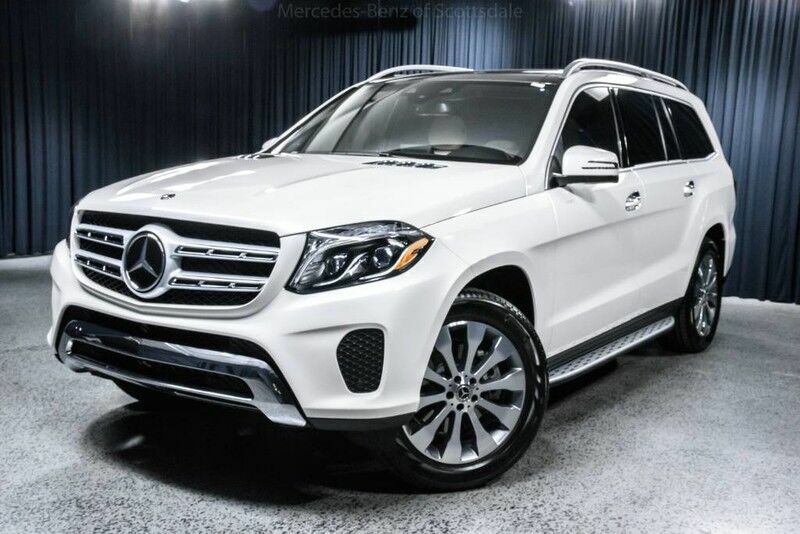 This 2019 Mercedes-Benz GLS is the perfect example of the modern luxury. Navigate through all the icky weather with ease in this AWD-equipped Mercedes-Benz GLS, and even get non-stop traction for your non-stop lifestyle! In addition to the amazing traction control, you may even qualify for an insurance reduction with this AWD vehicle. Based on the superb condition of this vehicle, along with the options and color, this Mercedes-Benz GLS GLS 450 is sure to sell fast.